Standing water in the crawl space can lead to mold and mildew growth, wood rot, structural damage, and health problems. Water can enter your crawl space from the ground, plumbing leaks, and heavy rain. No matter how the water is getting there, Woodford Bros., Inc. can help dry your crawl space with proven waterproofing solutions. Drainage matting: CleanSpace drainage matting improves drainage when installed under the CleanSpace vapor barrier. The dimpled surface helps carry water to the perimeter drainage or sump pump located at the lowest area of the crawl space. CleanSpace drainage matting also softens the floor and increases durability of the encapsulation system. If you have a wet crawl space that you need repaired, contact the crawl space repair experts at Woodford Bros., Inc. today. We'll recommend the best products to keep your crawl space dry and provide professional installation. 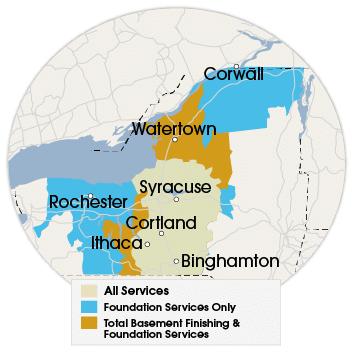 If you live in Rochester, Binghamton, Syracuse, Utica or the surrounding area in New York, contact us today to schedule your on-site crawl space inspection, which includes a free cost estimate.